Like the MK1 caddy which are super strong money now, these are also on their way up due to limited numbers of the truck. 1.9 Diesel. Clean inside for a truck! The truck is totally dependable, and has plenty of life left in it yet. May 1988 E reg Mk1 VW Caddy pickup, 1.6 petrol, mot 24th January 2020, 148k (not bad for a 30 year old car). Looks great, very tidy and very presentable, however its not a show car. Even as a daily. YOU ARE BUYING A VERY NICE CONDITION 2008 VOLKSWAGEN CADDY VAN 1.9 TDI MODEL IN RED THAT HAS DONE 248,000 MILES WITH THE FOLLOWING;. SIDE LOADING PASSENGER DOOR. REVERSE PARKING SENSORS. MANUAL DOOR MIRRORS WINDOWS. VOLKSWAGEN CADDY VAN. I DO HAVE IMAGES FROM BEFORE THE REPAIR, V5 WILL NEED TO BE APPLIED FOR . STATES CAMBELT AND WATER PUMP AND SERVICE WAS LAST DONE AT 87k. SECURITY DEAD LOCKS ON THE SIDE AND REAR DOORS. R32 Exhaust Pipes. R32 rear Bumper. Sought After Stunning Looking Caddy C20 1.6 TDI. All of fers wi ll be considered. C on tact m e at : nan o to uch 355 @ bt c ont act. Adjustable Coil Overs. Part Leather Seats. 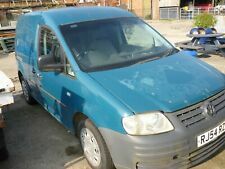 VW Caddy Mk2 van 2004 with 12 months MOT. Cam belt changed at 117,000. Good condition for year. At present equipped with Gardiner pure water window cleaning system. Brushes, tank and water purifying canister included. 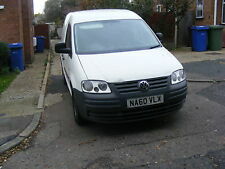 VW Caddy C20 Startline 1.6 TDi 102 bhp. Finished in White with Grey Trim this impeccable example. Full VW Service History. All of fers wi ll be considered. C on tact m e at : nan o to uch 325 @ bt c ont act. Carriage Co - We offer great value and great service. Come for a test drive and see what we can do for you. - Call us on 441905947511 or click here to find out more. VAN HAS 11 MONTHS MOT. VAN DOES LET OUT BLUE SMOKE. BACK DOOR HAS DEADLOCK. GOLD MK5 SPORTS SEATS AT THE FRONT. PARK ASSIST FRONT AND REAR. /LEATHER MULTI FUNCTION STEERING WHEEL. /HEATED FRONT SCREEN. HENCE ONLY 2,300 MILES. LWB with side windows, 5 seats and a tail gate. 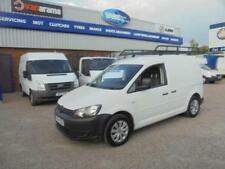 2015 64 reg VW Caddy 1.6tdi Bluemotion. Bluemotion Technology. And drives just like a car. Full service history. Rear blacked out windows. VW Caddy Maxi Combi 5 seater with rare and brilliant DSG Automatic gearbox and incredibly high factory specification. Sat Nav with touch screen. Colour coded bumpers. Multi function steering wheel. 26000 miles only. Excellent condition. Southern Mobility Vehicles - We always have a Gentle Approach to your next wheelchair accessible vehicle. - Call us on 441243213630 or click here to find out more. 102bhp engine. 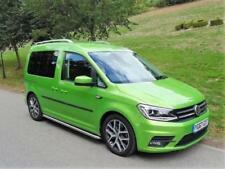 This is a sale for my Volkswagen Caddy van. This van is just about to reach 101,000 trouble free miles. Therefore the new owner has 12 months piece of mind. Volkswagen wheel trims. Other than that it really is in great condition. VW Caddy 2.0 TDI C20. New Cam Belt & Water Pump changed by VW. Full Service History. 113K Miles. SMOOTH AUTOMATIC DSG GEARBOX. FOR SALE IS A VW CADDY LIFE. SAT NAV/PHONE ETC. STEREO CD SYSTEM. SERVICE HISTORY. ALLOY WHEELS. FANTASTIC CADDY CONVERSION MAXI VAN AND ONE OF A KIND ON SALE! - EXTRA LIGHTS FITTED INSIDE THE VAN. VAN WILL UNDERGO A FULL VALET INCLUDING ALL THE SEATS PRO CLEANED. EXTRA PICTURES WILL BE UPLOADED SHORTLY.